Have a great day! Ciao, Bastet. This entry was posted in Haiga and tagged anticipation, Bastet's One Month of Haiga, Bolognano, Italy, Landscape Photograpy, photographic experiments, Storm, Trentino. Bookmark the permalink. I searched for pictures that show the signs of a storm coming and found it rather difficult. Which is another reason to learn photography. This was good. Many signs in nature telling of approaching weather! you pick great prompts. maybe i should invite a guest prompter next September, eh?? altho end rhyming is not usually a good idea in haiku, interior rhyming is. i find that interesting. i like the sound, the way it comes out of the 1st and 3rd lines when spoken. and i like the sound of all three ending words of each line. sound in haiku is important as i see it. i like the sound combinations that are rumbling around in this haiku. Could be fun in September … actually seems that sometimes in Japanese there is more rhyme than we think. I think the people who promoted English haiku were afraid that the rhyming would turn the haiku into nursery rhyme jingles … they had to find a way to maintain the particular personality of such a short poem in English – not an easy task I think. Another great prompt. 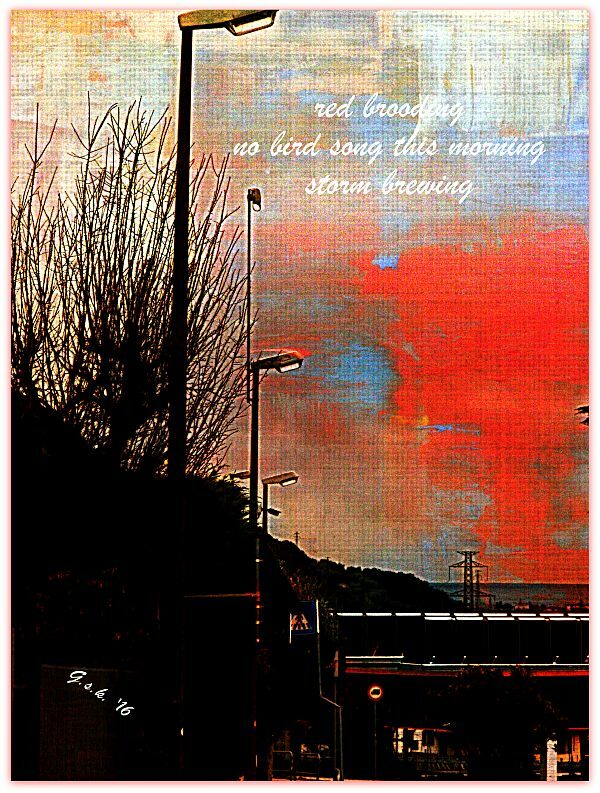 Once again I have edited a haibun from my old blog, Art and Life, and added a new haiga. A great prompt that I have just got around to. Have a lovely few days in Padua! Thanks Kim .. and now I want to find time to look at your haiga!